Uber-warrior Riddick (Vin Diesel) awakes wounded and besieged by the natural terrors of an alien planet. He's clearly a man of action, setting his own broken leg by jamming his foot in a crevice and . . . ew, and submerging himself for long minutes underwater until a pack of vicious hunting dog-things get bored. We have no idea why he's there (or where 'there' is) until an awkward flashback with gravelly Riddick voiceover provides the answer. Riddick is the third movie in David Twohy's Riddick franchise, following Pitch Black (2000) and The Chronicles of Riddick (2004) - it's evidently set five years after the latter. This one stands alone well enough, being in essence a science fiction survival thriller: Riddick (a wanted murderer) versus two bands of squabbling bounty hunters versus the native predators of the planet. Riddick wants off the planet; the bounty hunters have their own agendas; the predators . . . it's hard to tell much beyond their propensity to KILL, KILL! I really liked the opening of this film. It dumps the viewer into an exotic landscape and we gain a lot of knowledge about Riddick's character from how he deals with the situation. He's tough, resourceful, smart, patient - even caring. There's no dialogue - although Riddick does talk to a juvenile 'dog' pup, which he befriends - but we still know Riddick's objective is to heal, survive, find a way off this planet . . . But after the mystique and charm of the first 20 minutes or so, the movie degenerates into fairly standard fare. After deliberately activating a beacon to bring ships to the planet, Riddick is being hunted by men with big mouths and big guns - save for the token woman with a gun, woefully named Dahl (Katee Sackhoff), and a female prisoner who gets shot in the back to make room for the more impressive bounty in the form of Riddick. Yes, Riddick is impressive. He performs physical feats that are just plain ridiculous, but he also out-thinks those who are trying to capture him on multiple occasions, as he tries to gain access to one of the ships. On the other hand, the bounty hunters et al show an equivalent propensity for stupidity. The two separate mercenary groups are operating in a reluctant alliance that threatens to go pear-shaped at any minute. Santana (Jordi Mollá) wants Riddick's head in a box for the money, while the more decent leader of the other group, Boss Johns (Matt Nable), has a more personal agenda. With all the double-crossing going on, I was left wondering 'so what?'. And that was probably my major issue with the film. I ultimately didn't much care what happened. 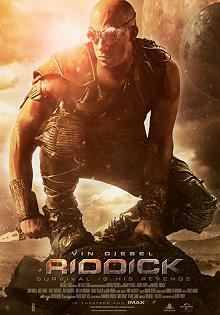 None of the characters are especially likable - even Riddick, the film's protagonist, is morally ambiguous at best. I guess my sympathies were aligned more with him than anyone; but it is Riddick who does most of the killing in this dog-eat-dog world - doubtless because he is just so damn good at it! I daresay Riddick will satisfy a cinematic need for those who like action, violence, weird creatures - and who don't care if a movie has a one-dimensional and predictable plot or fails the Bechdel Test. But, on the whole, it didn't really do it for me.